Ilumination from manuscript Chronica Majora written in latin by Benedictine monk Matthew Paris (c 1200-1259) showing Battle of Assandun 1016. On the left side depicting king Edmund II Ironside and on opposite side is Cnut the Great . 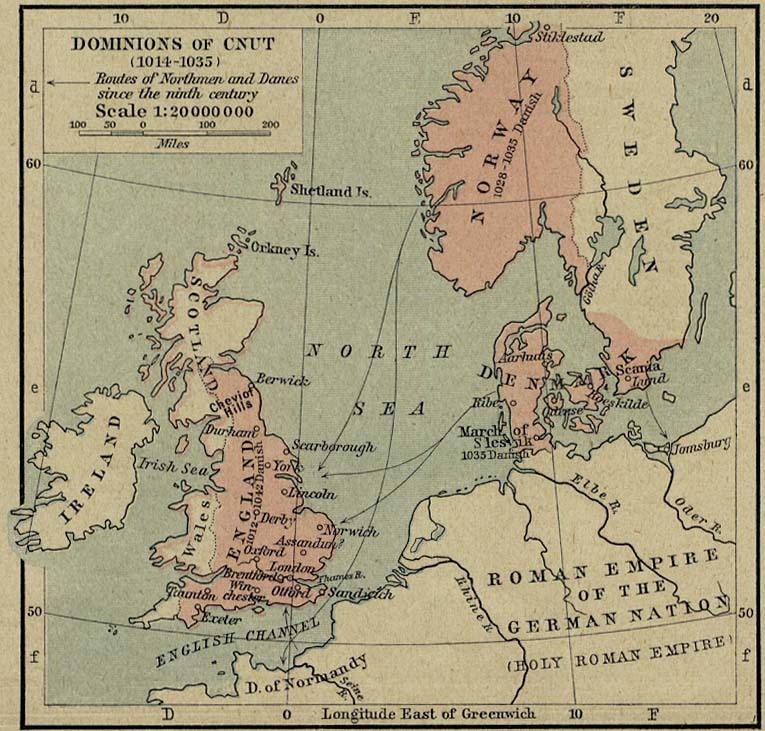 Cnut, or Canute, was the first Danish King of all England (1016-1035). Cnut was the King of Denmark from 1018 until 1035 and he was also King of Norway (1028-1035). He assumed the throne at the age of 23, having campaigned successfully and ruthlessly for his father Sweyn Forkbeard King of Denmark (986-1014). His mother was a daughter of the Polish nobleman Mieszko I. After the sudden death of King Sweyn Forkbeard in February 1014, the Danes army declared Cnut for the King. However, the noble assembly refuses to accept this and instead votes for Cnut they voted for King of England Æthelred II the Unready (1014-1016-second time) who was defeated in 1013 by Sweyn. Due to attack of Danes, Æthelred II were escaped to Normandy. Æthelred II gathered in Normandy an army that forced Cnut to retreat in Denmark with the rest of his army. Meanwhile, brother of Cnut Harold II became King of Denmark in 1014. Cnut had sought to jointly share the throne, which Harold II refused. But Harold II promised Cnut to help conquer England if Cnut no longer claimed the Danish throne. Cnut began an attack on England in 1015 with a large army within circa 10,000 people. His army was supported by the Norwegians,Danes and the mercenaries. With his fleet in April 1016, Cnut sailed along the River Thames and commenced the siege of London. During the siege of London English King Æthelred II died, and the new King of England became Edmund II (23th April-30th November 1016) also known as Ironside. 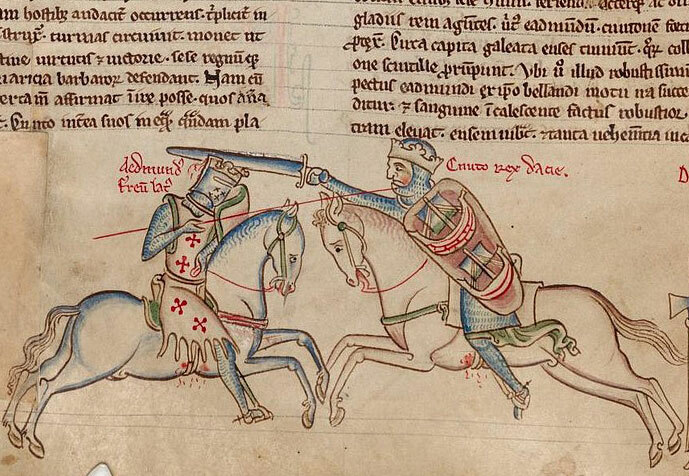 Edmund II left London with the intention of gathering an army against siege but at the Battle of Assandun on 18 October 1016 Cnut triumphed over the English army led by Edmund II. Edmund II and Cnut agreed to divide the English kingdom, but Edmund II died in November 1016 and Cnut become a king of whole England. First months as king for Cnut the Great were marked by single-mindedness in establishing his authority: potential rivals such as Eadwig, brother of Edmund Ironside were killed. Cnut demanded the loyalty of all bishops and ealdormen (high ranking royal officials like latin dux); and he raised an enormous tribute from his new subjects to pay off the Danish fleet. But within two years he set about proving to his Anglo-Saxon subjects that he would govern them according to the laws of his illustrious predecessor King Edgar, part of which was to treat the Witan of England with respect. Cnut’s marriage to Aethelred’s widow Emma of Normandy in July 1017 can also be seen as a reconciliatory gesture. Cnut divided the kingdom into four earldoms. Having kept Wessex, the cornerstone of Anglo-Saxon power for himself, East Anglia was given to Thorkel, Northumbria to Eric and Mercia to Eadric. But Eadric’s position was short-lived because in December 1017 Cnut killed him, knowing his double-dealing had done much to weaken Aethelred and Edmund. As king of England, Cnut the Great combined English and Danish institutions and staff. He returned the previous laws and reformed them and he was also initiator of many new laws and proclamations. He created new coins, which were of the same weight as those in use in Denmark and Scandinavia. This significantly boosted England’s trade, whose economy was down due to the period of disorder. Having secured his rule in England, Cnut felt able to return to Denmark in 1019 to establish his supremacy there following the death of his brother Harold. 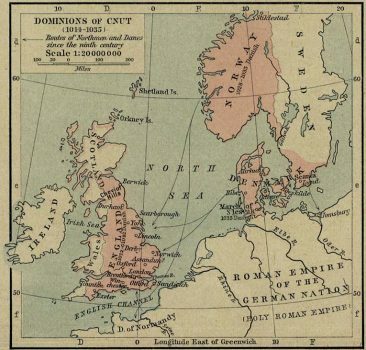 The Anglo-Saxon Chronicles record that Cnut went at least twice more to Scandinavia. In 1026 he was defeated in a naval battle at the Helgea (Holy River) in Denmark by the forces of Sweden and Norway, and in 1028 Cnut successfully fought King Olaf of Norway and established his overlordship of that country, including its dominions Shetland, the Orkneys, the Hebrides and the Isle of Man. However, unlike his son and successor Harthacnut, Cnut was careful not to use his English subjects just as a means of financing his Scandinavia ambitions. Historical Atlas by William Shepherd (1923-26). University of Texas at Austin. It is difficult to conclude whether the Cnut the Great was actually in favor of the church because of deep religious feeling or he tried to had good relations with church in order to rise his political power. Cnut was a Christian monarch, but his army that conquered England was mostly pagan, so he was tolerant towards pagan religion. He repaired many churches in and monasteries in England after his previous war against Æthelred II. He also founded many new churches and handed numerous gifts and relics to the church. Since history was then written mostly by people from churches or monks, it could be a distorted picture due to his merits for the church. In 1027 Cnut visited Rome to attend the coronation of Emperor Conrad II. No previous English king had made such a trip and it signals the confidence Cnut possessed in his kingship, and in his wider position in Christendom. At his death Cnut had restored the morale and dignity of Anglo-Saxon England after the battering it had taken in the years of Aethelred’s reign. He had built on the laws of his predecessors, respected their traditions and brought peace after years of war and the threat of invasion. Even the most famous story of his rule, that of him trying to turn the tides, suggests he was demonstrating not his arrogance, but the limitations of kingly authority. Cnut had three sons: Harthacnut by his wife Emma, and Sweyn and Harold “Harefoot” by his English mistress Aelfgifu. When he died at Shaftesbury on 12 November 1035, Cnut had not chosen a successor and this led to years of uncertainty and turmoil. Edward Augustus Freeman, The History of the Norman Conquest of England, Vol I, Oxford 1867. Alexander R. Rumble (editor), The Reign of Cnut: King of England, Denmark and Norway, Studies in the Early History of Britain, London 1994. M.K. Lawson, Cnut: England’s Viking King 1016-35, UK 2011.